Purgatory is the ongoing saga of a man with a passion for fire. One day he was caught in one of his creations and died. He now lives in Purgatory, but it's unlike what he always envisioned. 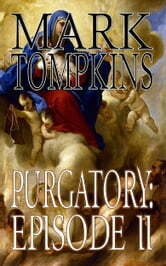 Purgatory is a neighborhood and he's doomed to this supernatural suburbia until he can be prayed out it. In Episode II, Mr. Crispy spends a day at the hospital and then saves a beautiful woman from being eaten by a huge crab.